Should publishers place Google Adsense code below post title? YES and NO! When you're in doubt about any adsense related issue - DON'T DO IT. This is Google's usual answer to controversial issues relating to adsense implementations and policy guidelines. I have written several Search engine Optimization posts and tips on this blog to serve as a resource center for others but not many relating to Google Adsense. The reason is, no one can claim to know all about it when the policy leaves room for doubt. The Google Adsense Program has laid out not-so-simple to understand Policy guidelines and failure to comply with them usually gets publishers kicked out of the program. Lets talk about one of them today. Should You Place Google Ads Below Post title? 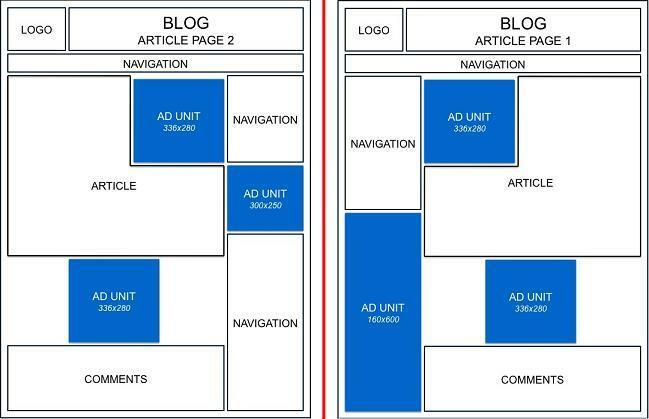 The Term "Above Fold" in relation to adsense is the area of a Page that is immediately visible without Scrolling. - Big-G went all out to introduce an application that will help you know where exactly to place your ads, they called it "Above Fold Application"
The Google adsense optimization page advices bloggers to use any of the following ad placement layouts or variations of it for article pages. Take Note special of the div float attribute used. Keep your ads looking like ads: Choosing ad colors that complement your site is great, but avoid aligning images with your ads or making nearby content mimic their formatting. Displaying ads in these ways isn't permitted by our program policies. Ads should be easily distinguishable from surrounding content. Similarly, you should not place an ad unit by a group of links that has identical colors and line spacing. Doing so may cause users to think the ad unit is content created by you. In this situation, we recommend using a different color for the ad titles or indenting the ad unit to help distinguish the ads from your own content. Big names in the industry implement ads below post title according to the terms (Don't make the ads similar to the content) - If you cannot Wrap your ads as shown in the images and choose to Center it below post titles, add a Border, make it different from your content font, colour, style, etc. Ads below Post has the highest Click through rate (CTR) but to be safe - avoid the Below post ad placement position - A word they said is enough for the wise.